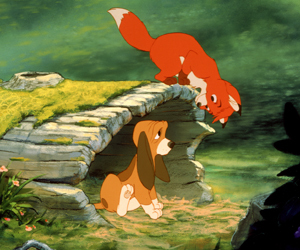 I love this part of The Fox and the Hound–the whole scene. Rewatching it to do this blog, I really started to think how depressing it really is, though. 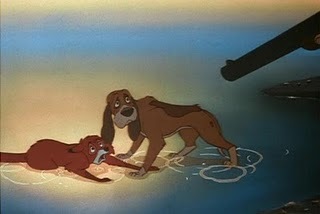 Many Disney films start with something sad, particularly the loss of a parent or something similar. This is backwards. It begins happily and slowly gets worse until it gets out of control. Then it’s happy again, but not in the same way it was before. I think it’s a great symbol of the iconic view of childhood, a coming-of-age done differently. The story of two friends no longer allowed to be friends, as one swears vengeance on the other because of an accident, reminds me of something from classic literature that I cannot recall. It feels so familiar. If it rings a bell for you, please share. So, anyway, this is a pretty iconic Disney piece, particularly my favourite scene, where Copper (at this point played by Corey Feldman–The Goonies, Gremlins) meets Tod (played as a wee one by Keith Coogan–Adventures in Babysitting, Toy Soldiers, Don’t Tell Mom the Babysitter’s Dead, and lots of TV bits). They meet in the woods between their homes, which is also the home of characters that Tod has grown up knowing–in fact, that found him his home with Widow Tweed (Jeanette Nolan, whom we talked about on The Rescuers post). It has quite the cast, too. 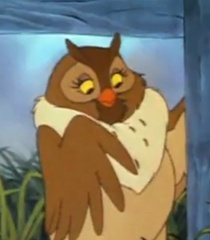 Singer Pearl Bailey plays Big Mama, the owl–a nice choice, since she pretty much performs the soundtrack, and her voice sums up Big Mama’s personality. They couldn’t have done better. 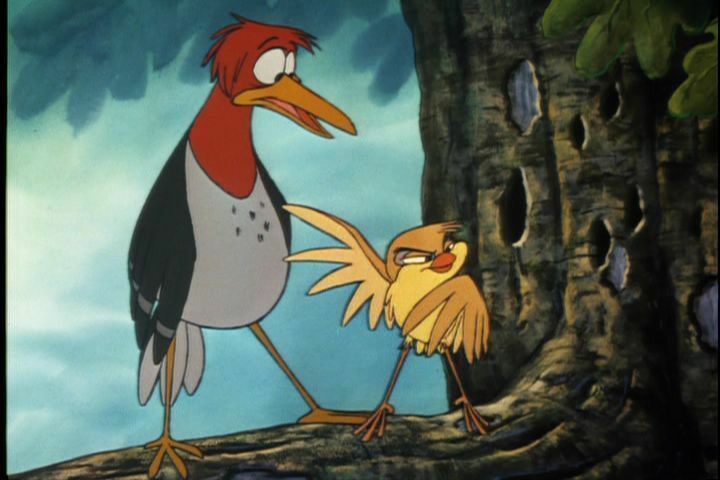 The woodpecker, Boomer (Paul Winchell, in case you couldn’t recognize classic Tigger), and the finch, Dinky (Richard Bakalyan, whose voice set him up for great action and gangster movies, but had also done Disney work in Escape to Witch Mountain), are constantly after the same poor worm, which they never can seem to catch. This pair is their own little mini-mob, and their struggle presents one of Disney’s most seamless and persistent comedic subplots. 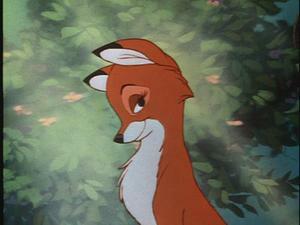 Vixey, the appropriately named vixen that Tod meets in the forest at the nature preserve is played by Sandy Duncan. Duncan is well-known for her many television roles and her Broadway turn as Peter Pan. But for all you big animation fans, you might know her as the voice of Firefly from My Little Pony, Queen Uberta from The Swan Princess, and Peepers from Rock-a-Doodle. 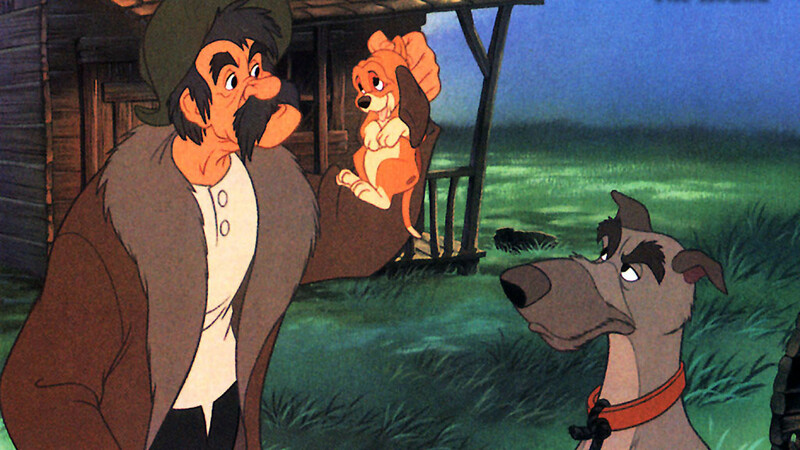 As adults, Tod and Copper are voiced by Mickey Rooney and Kurt Russell. I’m not even going to try to list their filmographies of note… but I will say that as a child, I sure didn’t notice who they were. It’s odd, as Pete’s Dragon is still one of my favourites, but I didn’t recognize Mickey Rooney as Tod for anything, though to listen to him now, he sounds incredibly familiar. Again, we see Pat Buttram (Chief) because Disney couldn’t make a film without him during this time, and John Fielder (with a small part as the kind porcupine). John McIntire, whom we talked about last week, shows up as the grouchy badger, which I’ve heard a number of people mention as their favourite character in the film. Now, we have to talk about our villain. Amos Slade is perhaps not as much evil as closed-minded. He shows he cares about his dogs, though he’s reclusive and doesn’t care for people. He is primarily driven by misplaced vengeance against Tod, first from circumstances with his chickens and then for blaming Tod for Chief’s injuries–but Copper does, too. He just doesn’t come off as evil or even as frightening. It could be because Widow Tweed has no trouble standing up to him. It could also be that he’s voiced by Jack Albertson, whom I know best as Grandpa Joe from Willy Wonka and the Chocolate Factory. 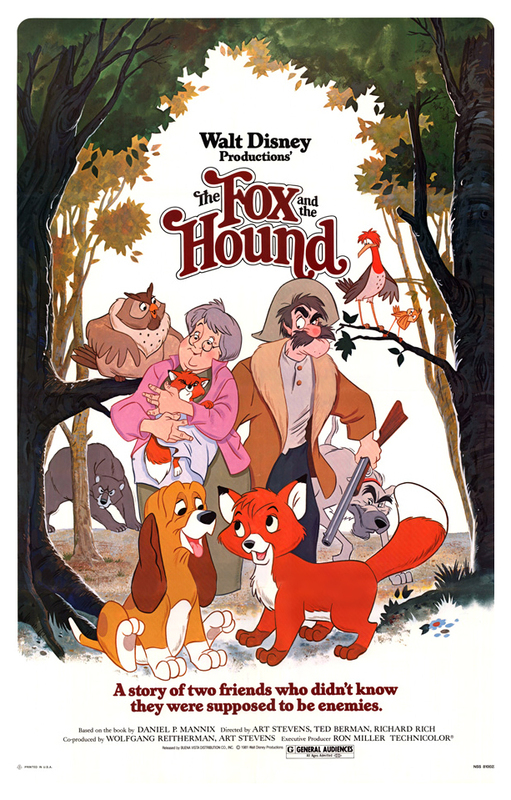 The Fox and the Hound is unique for Disney, because it doesn’t focus on someone good facing someone evil and scary, as these films often do. It has internal and personal struggles, particularly Copper trying to choose the right thing, and the fact that Tod just can’t find a suitable place to belong. For this reason, it’s one of Disney’s most relatable for children, as most children can identify with these two problems, even more so than with the truly evil villains that are so frightening and exciting in our stories. Perhaps that’s what makes this one special. This movie has its flaws but one thing I really did like about it was the fact that even though Tod and Copper do rediscover their friendship, they can never be together the way they used to be. Nowadays, Disney drills it into us that love overcomes all boundaries, between mermaid and prince, between thief and princess, between beast and bookworm, etc. In this film, despite all good intentions, there are some laws of the world that can’t be changed, some things that we inevitably lose with time, and the best we can do, like Tod and Copper, is to work within these limitations. That’s more bittersweet and subtle than most Disney movies. The scene you described at the top of your post is my favorite one in the movie. 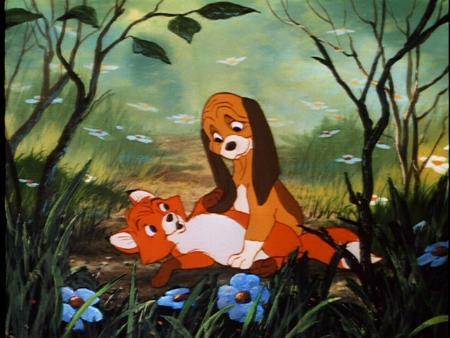 I’d rank FOX AND THE HOUND in the second tier of Disney animated films. I always enjoy your fabulous Disney reviews! I enjoyed this movie as a child, but I can’t watch it as an adult. I don’t really know why–maybe it’s just too sad. Somehow, that didn’t bother me as much when I was a young’un. Rachel makes a really good point in that the “lesson,” as it were, of this movie is much more mature, in many ways, than the films that have followed it. The older films in the Disney canon may (seemingly) go out of their way to scar children, what with the abundance of dead parents and frightening villains, but there’s a simple honesty about the human experience that is inherent in most of those movies.